William Tootell was born in Adlington in 1895, one of six children born to Elizabeth and Robert Tootell. The 1911 Census had the family living at 148 Cemetery Road in Adlington, with William working at a Colliery. Upon enlisting in the Pals on the 17th September 1914, he was living with his father at 16 Spendmore Lane in Coppull and attended Coppull Old Parish Church; a single man, he worked at Duxbury Park Colliery. 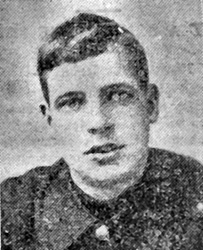 William was killed on the morning of the 1st July 1916 at Serre and his body was recovered from No Man’s Land in the spring of 1917. He now lies in Queen’s Cemetery at Serre, sharing a grave with an unknown soldier.